"By the end of the night, they were barely alive. They hurled Dora Lewis into a dark cell, smashed her head against an iron bed and knocked her out cold. Her cellmate, Alice Cosu, thought Lewis was dead. She suffered a heart attack. Additional affidavits describe the guards dragging, beating, choking, slamming, pinching, and kicking the women. Thus unfolded the 'Night of Terror' on Nov. 15, 1917." The below message is a powerful and inspiring reminder of how far we have come. 200 years ago, slavery was the order of the day. 100 years ago women were not allowed to vote. Read this shocking tale of what some women in the United States had to go through to get the right to vote, and maybe you will be inspired to deepen your commitment in this modern day to help build a brighter future for us and for our children. 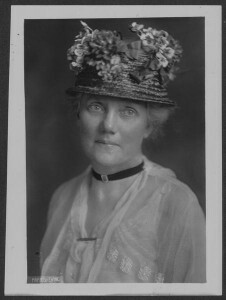 In the spring of 1917, members of the National Woman's Party (NWP) began picketing the White House and the Capitol as part of a campaign for a constitutional amendment guaranteeing universal suffrage. 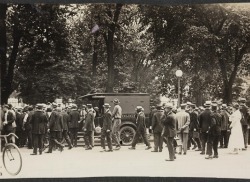 By mid-June, NWP leader Alice Paul had been warned by the chief of police that further demonstrations would lead to arrests. In the following months, many were arrested. Some were tried and sentenced to sixty days in Occoquan Workhouse in suburban Virginia. 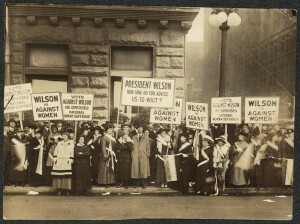 These women were innocent and defenseless, but they were jailed nonetheless for picketing the White House and carrying signs asking for the right to vote. 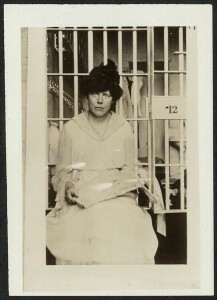 One fateful November night while still in jail, many of these brave women were subjected to the wrath of the male institution. Forty prison guards wielding clubs and their warden's blessing went on a rampage against the 33 women wrongly convicted of 'obstructing sidewalk traffic.' And by the end of the night, they were barely alive. They beat Lucy Burns, chained her hands to the cell bars above her head and left her hanging for the night, bleeding and gasping for air. They hurled Dora Lewis into a dark cell, smashed her head against an iron bed and knocked her out cold. Her cellmate, Alice Cosu, thought Lewis was dead. She suffered a heart attack. Additional affidavits describe the guards dragging, beating, choking, slamming, pinching, and kicking the women. Thus unfolded the 'Night of Terror' on Nov. 15, 1917, when the warden at the Occoquan Workhouse in Virginia ordered his guards to teach a lesson to the suffragists imprisoned there because they dared to picket Woodrow Wilson's White House for the right to vote. For weeks, the women's only water came from an open pail. Their food – if you can call it that – was infested with terrible vermin. 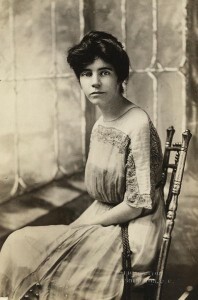 When picket leader Alice Paul embarked on a hunger strike, they tied her to a chair, forced a tube down her throat and poured liquid into her until she vomited. She was tortured like this for weeks until word was smuggled out to the press. So, refresh my memory. Some women won't vote because – why, exactly? We have carpool duties? We have to get to work? Our vote doesn't matter? It's raining? Last week, a friend of mine went to a sparsely attended screening of HBO's new movie ‘Iron Jawed Angels.' It is a graphic depiction of the battle these women waged so that I could pull the curtain at the polling booth and have my say. I am ashamed to say I needed the reminder. 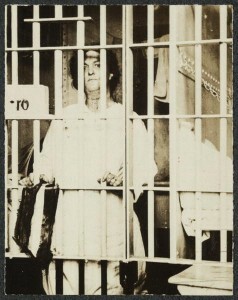 Pauline Adams in prison garb she wore while serving a sixty-day sentence. HBO released the movie on video and DVD. I wish all history, social studies and government teachers would include this movie in their curriculum. I want it shown anywhere women gather. I realize this isn't our usual idea of socializing, but we are not voting in the numbers that we should be, and I think a little shock therapy is in order. 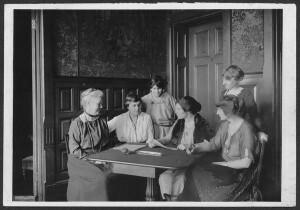 Conferring over ratification of the 19th Amendment to the U.S. Constitution at NWP headquarters, Jackson Place, Washington, D.C. Please, if you are so inclined, pass this on to all the women you know. And men, too. We all need to get out and vote and use this right that was fought so hard for by these very courageous women. Whether you vote democratic, republican or independent party – remember to vote. 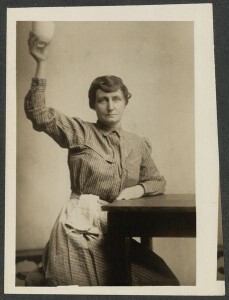 For a U.S. Library of Congress listing of these and other suffrage prisoners, click here. The original author of this article on women's right to vote is Pulitzer Prize- winning columnist Connie Schultz. She is married to U.S. Sen. Sherrod Brown. For her regular column, click here. The essay has been edited for clarity. To check the veracity of the article's contents, click here. Ms. Schultz wrote this article after viewing a powerful documentary on the women's right to vote movement titled Iron Jawed Angels, which is available here.